The recipes in this cookbook have been gathered from CWA members across South Australia and spanning generations. No-fuss, stress-free and with delicious results, these tried-and-true recipes are sure to reveal the country baker in everyone. The SACWA would like to acknowledge the generous support of Laucke Flour Mills. For every box of Laucke CWA Scone Mix sold, 30c is donated to the CWA. All proceeds from the sale of this cookbook go to the South Australian Country Women’s Association. 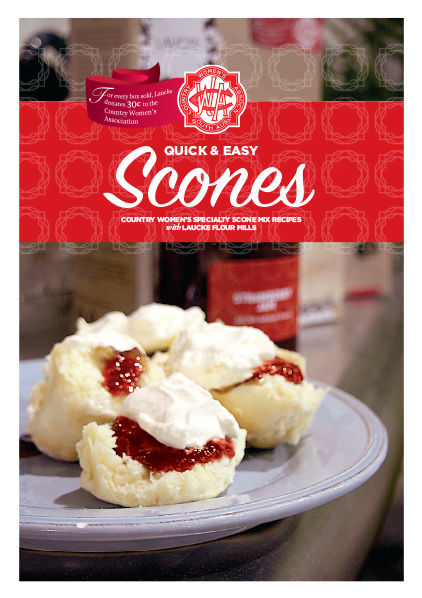 Quick & Easy Scones was kindly designed by SACWA member Kate Swann.